When we talk about steel pipe, sometimes we say LSAW steel pipe, and do you know what LSAW pipe definition is. And what is main features of LSAW? How many steps when making a lsaw pipe need? 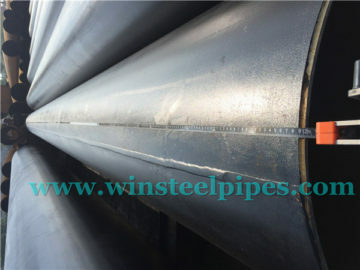 We can learn more about LSAW pipe as one kind of carbon steel pipe. 1) What is LSAW steel pipe definition? LSAW means Longitudinal Submerge Arc Welding carbon steel pipe. 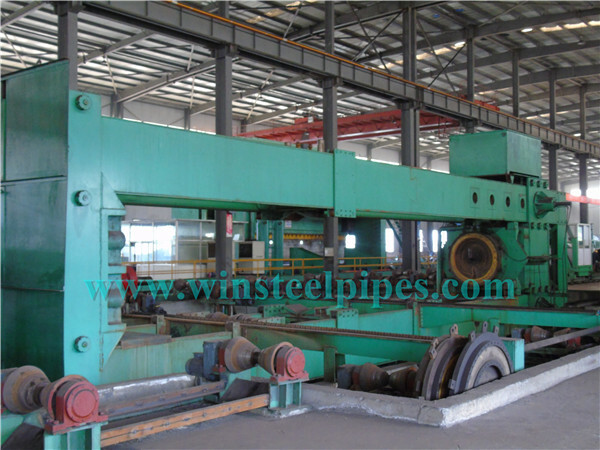 It is a kind of SAW pipe made of steel plates that were hot rolled by JCOE or UOE manufacturing process. JCOE technology means the shaping and forming processes. This forming process JCOE include during producing as well as the inner and outer welding and cold expansion carried out after welding. 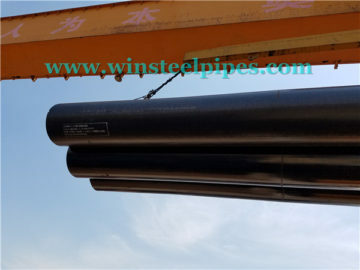 From this we can see that the LSAW pipe having superiority. 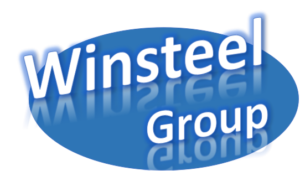 We, Winsteel Group offers LSAW steel pipe with high quality, competitive prices and best service. 1. 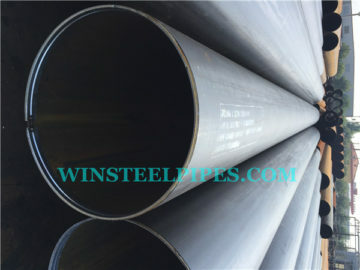 According to the specification of pipe API 5L Spec, we take testing for the basic metal and welding metal. Specification such as DIN, EN, ASTM, GOST standard and etc. 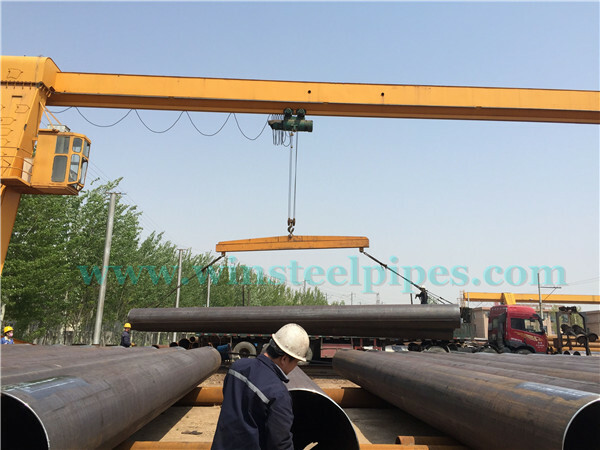 Also, LSAW steel pipe can be welded with flanges, lifting eyes and other parts according to clients’ requirements. 2. It also can used as pipe boots or pile boots which are acted as protecting section. 3. 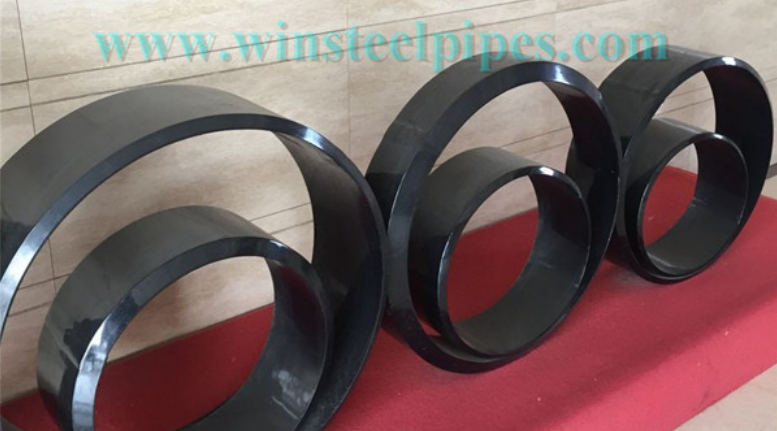 Except used as pipe boots, LSAW steel pipe are also used for transporting fluids like water, oil & gas as well as used for offshore projects and underground constructions. These products are producing in China and are exported to other countries like Australia, Canada, South American, Europe, Malaysia, India, Pakistan, Africa, etc. This is used for making the large diameter LSAW joints right after it enters the production line which is the initial full-board ultrasonic testing. The machine used for milling does this operation through two-edged milling plate to meet the requirements of the plate width and the sides parallel to the right shape and exact degree. This side is achieved by using a pre-bending machine on the pre-bending plate edge. The plate edge needs to meet curvature requirement. After the pre-bending step, in the first half of the JCO molding machine, after stamped steel, it is pressed into a “J” shape while the on the other half of the same steel plate it is bent and pressed into a “C” shape, then the final opening forms an “O” shape. This is to make a welded pipe steel a straight seam after it has been formed and then use gas welding seam (MAG) for continuous welding. This is done with a tandem multi-wire submerged arc welding (about four wire) on the inner part of the straight seam welded steel pipe. 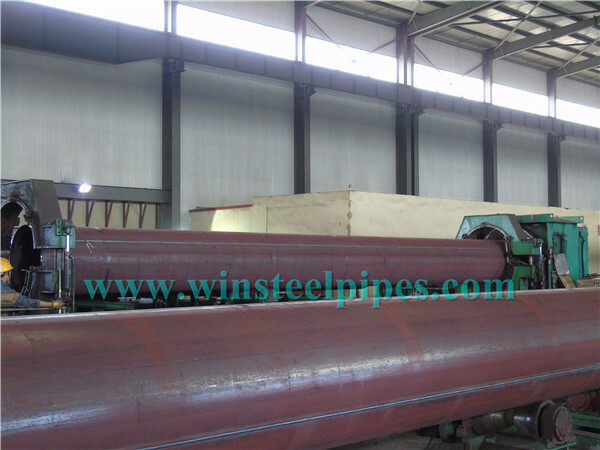 Outside weld is the tandem multi-wire submerged arc welding on the outer part of the LSAW steel pipe welding. This test are checking outside and inside straight seam of welded LSAW steel pipe. And also check both sides of the base material. 100% pipes are taking ultrasonic inspection. X-ray industrial TV inspection is carried out on the inside and outside using image processing system to make sure there is detection sensitivity. 100% pipes are taking X-ray inspection. 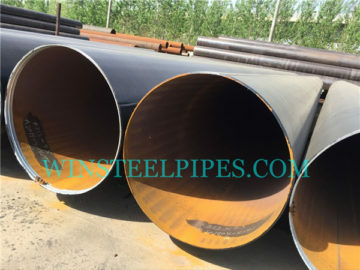 This is for accomplishing submerged arc welding and straight seam steel pipe length hole diameter so as to improve the steel tube’s size precision and improve the distribution of stress in the steel tube. This steps can according to customer’s requirements. LSAW pipe hydrostatic test is carried out on the hydraulic test machine for steel after expanding by-root test for ensuring the steel pipe meets the standard requirements with the machine having an automatic recording and storage capabilities. Pipe chamfer is the last step for pipe manufacturing process. It makes pipe end bevelled which is convenient for welding in field. 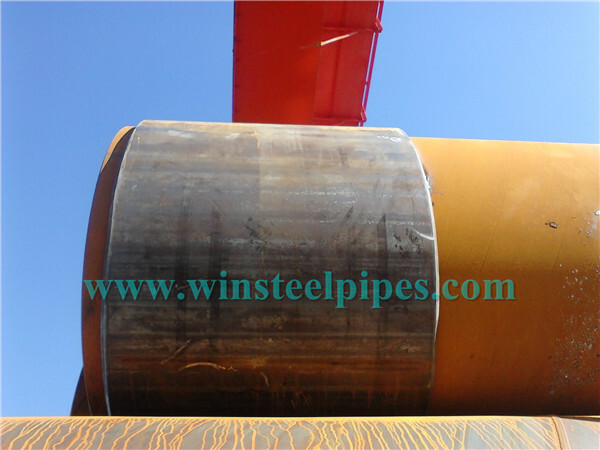 This also involves the surface inspection carried out on the steel pipe at the end of the whole process. Of course, this step is according to customer’s requirement. 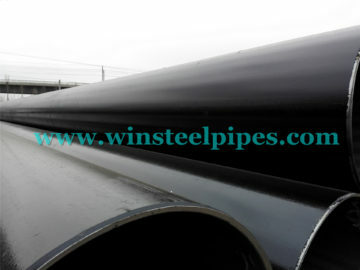 And according to API 5L PSL 2 level, it has steel pipe end plain. 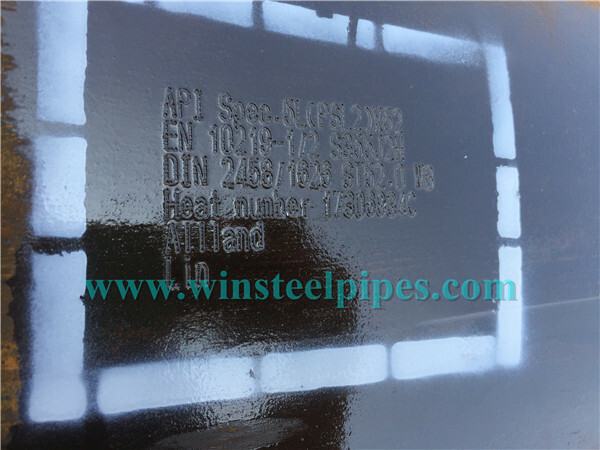 LSAW steel pipe marking is not the manufacturing process. But it is can not omit. 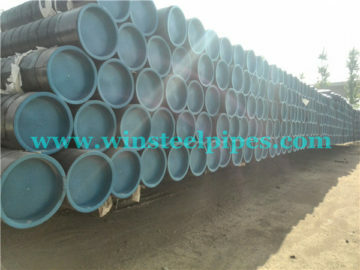 This steps is very necessary as it can directly tell users the information of the pipe. It has many kinds of marking, the most popular are stamping and die mark. Till now, I think you have a impression for LSAW. 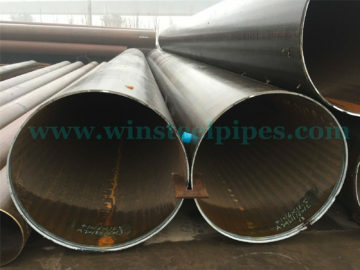 What does LSAW means, pipe size range, and LSAW manufacturing process. 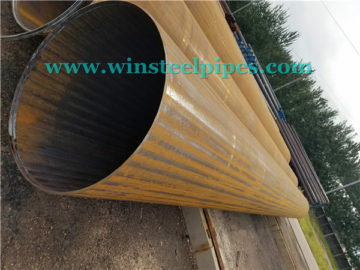 And if you want to have more information about steel pipe, or about our factory, please do not feel hesitate to contact us. We are professional LSAW steel pipe manufacturer.